Bully is our newest pit rescue, she is 7 months. She was rescued as a companion for my 4 1/2 year old son. 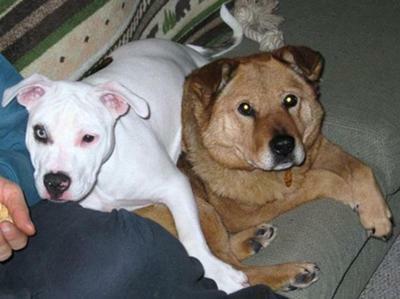 Kumiko is an 8 years old pit/chow & was rescued as a pup in North Carolina. She is a wonderful dog for Bully to grow up with & learn from as she is patient and kind.